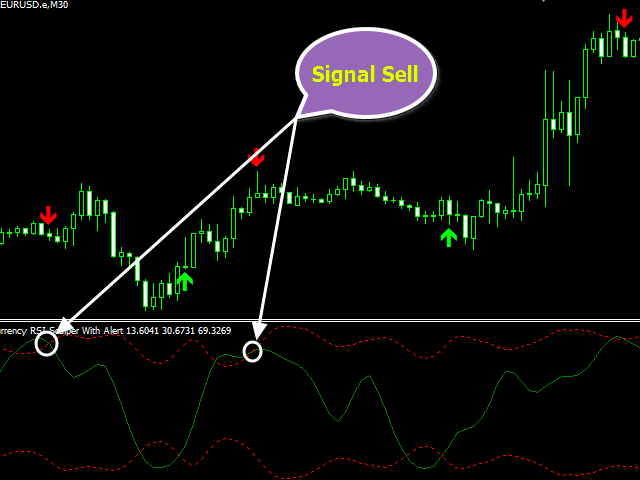 Currency RSI Scalper -is a professional indicator based on the popular Relative Strength Index (RSI) indicator. This product is an oscillator with dynamic overbought and oversold levels, while in the standard RSI, these levels are static and do not change. This allows Currency RSI Scalper to adapt to the ever-changing market. When a buy or a sell signal appears, an arrow is drawn on the chart and an alert is triggered allowing you to open a position in a timely manner and avoid sitting at your PC all the time. Currency RSI Scalper is perfect for trading currencies (including cryptocurrencies) and binary options. 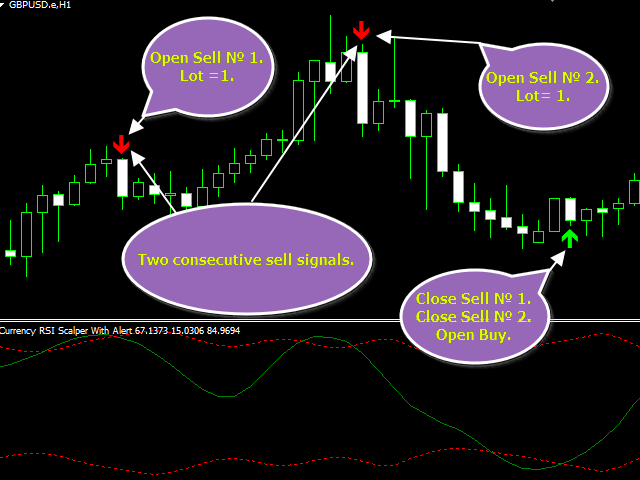 Currency RSI Scalper for MetaTrader 5 can be downloaded here: https://www.mql5.com/en/market/product/33032. 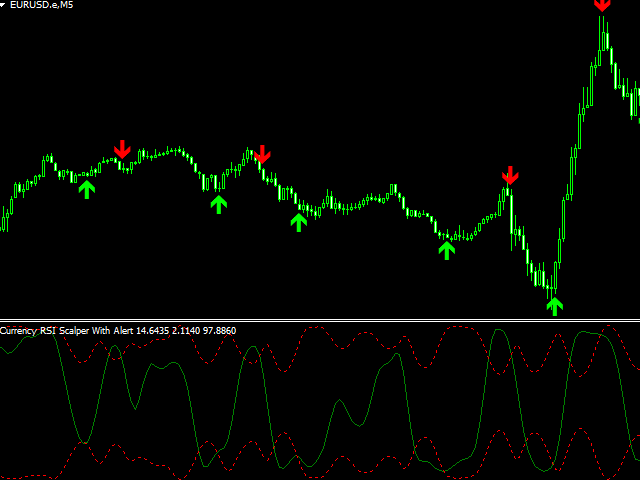 The indicator is suitable for scalping and intraday trading. It is possible to evaluate the effectiveness of the indicator on history. The indicator does not redraw (recalculate), signals are generated strictly on the "Close of the bar". It can be used as a standalone tool or together with other indicators. System of notifications to email and mobile device on new indicator signals. Ability to customize the color scheme of the indicator. Optimum operation algorithm, therefore the terminal does not "freeze"
Buy signal: the indicator line crossing the oversold level upwards. If there are open sell positions, they should be closed. See screenshot #2. Sell signal: the indicator line crossing the overbought level downwards. If there are open buy positions, they should be closed. See screenshot #3. There may be situations with several consecutive signals in the same direction. In this case, open an additional position in the same direction without closing the previous one. See screenshot #4. Several positions are to be closed only when an opposite signal appears. Period - RSI setting. Period of averaging for calculation of the indicator. Method: The method used to calculate the Moving Average. The following options are available: 1-Simple, 2-Exponential, 3-Smoothed, 4-Linear Weighted. Alert - enable or disable Alerts. True - enabled, false - disabled. 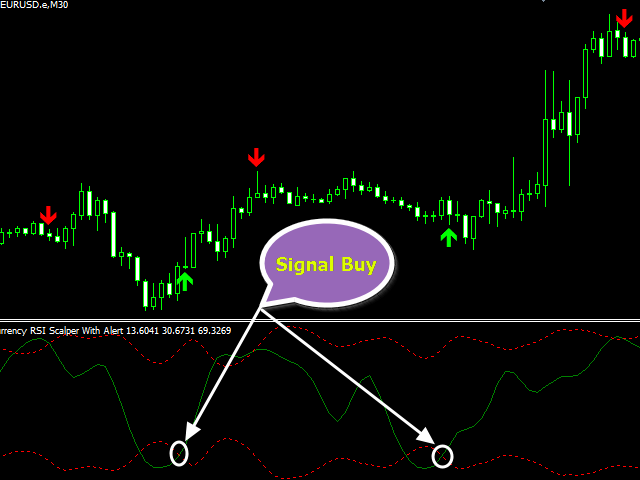 Example of an alert: "Currency RSI Scalper EURUSD M30 BUY". Arrow size - size of arrows on the chart (1 to 7). Buy - color of buy arrows. Sell - color of sell arrows.